Over the past few years, meditation has evolved from an of-the-moment fad to a legitimate health craze, as research has linked the practice to everything from improved cardiovascular health to cognitive benefits. Science has even shown that mindfulness meditation can affect gene expression. 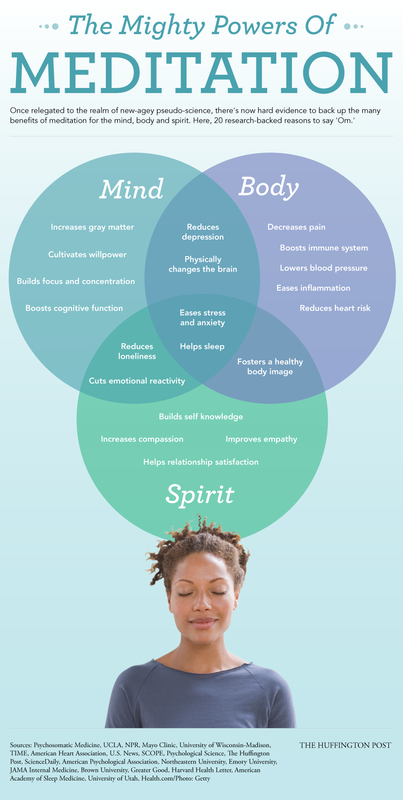 While the modern-day science behind this age-old practice is still developing, plenty of studies suggest that meditation is about way more than blissing out -- take a look at some of the possible benefits below, and scroll down for more information on each. Reduces Pain Several studies have identified a connection between meditation and pain. One Journal of Neuroscience study, for instance, showed that after four 20-minute meditation sessions over the course of four days, a group of volunteers rated the same burning pain as 57 percent less unpleasant and 40 percent less intense, Health.com reported. Plus, a review of 47 studies published in JAMA Internal Medicine earlier this year showed that meditation may be helpful in easing pain (though it was difficult for the researchers to identify exactly what type of pain, according to Reuters). Researchers speculate that those who practice meditation develop the ability to exert greater control over unpleasant feelings, including pain, by turning them down as if using a "volume knob" in the brain. Boosts immune system. One small 2003 study showed a link between an eight-week mindfulness meditation program and better immune function, and 2012 UCLA research suggested meditation could improve the immune system in older people. Lowers blood pressure. A study co-directed by Dr. Randy Zusman at Massachusetts General Hospital took patients being treated with typical high blood pressure medication and taught them a technique called the relaxation response; more than half experienced a drop in blood pressure, sometimes even resulting in reduced medication, NPR reported. "I'd been using medications in these patients, they were hopefully following my recommendations," Zusman told NPR. "[But] we still couldn't get their blood pressure under control. And I was somewhat skeptical that meditation could be the key to blood pressure control." What's more, the Mayo Clinic reports that research suggests meditation could be helpful in managing the symptoms of high blood pressure. Eases inflammation. In 2013 research at the University of Wisconsin-Madison and the Center for Investigating Healthy Minds in the Waisman Center, scientists identified a possible tie between mindfulness meditation and the relief of inflammatory symptoms among people who suffer from chronic inflammatory conditions. “This is not a cure-all, but our study does show that there are specific ways that mindfulness can be beneficial, and that there are specific people who may be more likely to benefit from this approach than other interventions," lead author Melissa Rosenkranz said in a statement. Reduces heart risk. A 2012 study published in the journal Circulation: Cardiovascular Quality and Outcomes showed a link between Transcendental Mediation and a reduction in heart attack, stroke and early death from heart disease in a group of African Americans, TIME reported. “The main finding [of our research] is that, added on top of usual medical care, intervention with a mind-body technique -- transcendental meditation -- can have a major effect on cardiovascular events,” lead author Robert Schneider, a professor at the Maharishi University of Management, told the publication. The American Heart Association also says that the stress-busting benefits of different types of meditation can be a boon to heart health. Increases gray matter. Meditation may just be exercise for the brain. In fact, a 2009 study from UCLA researchers showed that MRI scans of long-time meditators revealed that certain parts of their brains were larger than those of a control group, particularly in regions known for emotion regulation. Another small study published in 2011 in the journal Psychiatry Research: Neuroimaging showed that an eight-week mindfulness-based stress reduction program resulted in increases in gray matter in the hippocampus and areas of the brain tied to compassion and self-awareness, U.S. News reported at the time. Builds focus and concentration. A 2010 study published in Psychological Science showed that Buddhist meditation improved focus and attention on a task that was designed to be both boring and demanding. "People may think meditation is something that makes you feel good and going on a meditation retreat is like going on vacation, and you get to be at peace with yourself," study author Katherine MacLean, who worked on the research as a graduate student at the University of California Davis, said in a statement. "That's what people think until they try it. Then you realize how challenging it is to just sit and observe something without being distracted." Boosts cognitive function. Another Psychological Science study identified a link between mindfulness training and increased standardized test scores, as well as improvements in working memory. What's more, Dr. Sara Lazar, a neuroscientist at Massachusetts General Hospital who studies mindfulness meditation, previously told HuffPost that regular meditation may stave off the thinning of the brain's prefrontal cortex, and in turn declines in cognitive function, later in life. Builds self knowledge. According to a 2013 article published in Perspectives on Psychological Science, mindfulness (defined as "paying attention to one's current experience in a non-judgmental way") can help people to understand their own personalities. "For example, one who overestimates the positivity of his or her personality or status is often disliked by others, whereas having insight into how others perceive the self and acknowledging one's flaws seems to attenuate the negativity of others' impressions," the researchers wrote in the study, as previously reported by HuffPost. Several studies find that a person's ability to be mindful can help predict relationship satisfaction — the ability to respond well to relationship stress and the skill in communicating one's emotions to a partner. Empirical evidence suggests that mindfulness protects against the emotionally stressful effects of relationship conflict (Barnes et al., 2007), is positively associated with the ability to express oneself in various social situations (Dekeyser el al., 2008) and predicts relationship satisfaction (Barnes et al., 2007; Wachs & Cordova, 2007). Improves empathy. A small study from Emory University showed that a compassion-based meditation program, called Cognitively-Based Compassion Training (CBCT), might help people to read others' facial expressions, HuffPost reported when the results were released in 2012. "These findings raise the intriguing possibility that CBCT may have enhanced empathic abilities by increasing activity in parts of the brain that are of central importance for our ability to recognize the emotional states of others," senior author Charles Raison said in a statement. Improves depression. The 2014 review of 47 randomized trials, published in JAMA Internal Medicine, showed that mindfulness meditation can be effective in easing depression for some patients, as well as anxiety, HuffPost previously reported. The researchers wrote: "Anxiety, depression, and stress/distress are different components of negative affect. When we combined each component of negative affect, we saw a small and consistent signal that any domain of negative affect is improved in mindfulness programs when compared with a nonspecific active control." And depression has been linked with other serious health conditions, including heart disease. Physically changes the brain. University of Oregon Research released in 2012 suggested that one type of Chinese mindfulness meditation could be associated with physical changes in the brain -- ones that might help stave off mental illness, HuffPost reported when the findings were released. Reduces loneliness. At least among older people. A 2012 Brain, Behavior and Immunity study of 40 adults between the ages of 55 and 85 showed that a two-month mindfulness meditation program was linked with reduced loneliness. "While this was a small sample, the results were very encouraging," Dr. Michael Irwin, a professor of psychiatry at the Semel Institute for Neuroscience and Human Behavior at UCLA and director of the Cousins Center, said in a statement when the findings were released. "It adds to a growing body of research that is showing the positive benefits of a variety of meditative techniques, including tai chi and yoga." Like pain, researchers have suggested that mindfulness meditation helps the brain to have better control over sensations, including negative emotions. Fosters a healthy body image. Australian research published in Clinical Psychologist suggested that being mindful (which can be cultivated through mindfulness meditation) may be linked to having a healthier relationship with food and your body, Berkeley's Greater Good reported. Eases stress and anxiety. The review of studies from Johns Hopkins University researchers that was published earlier this year in JAMA Internal Medicine showed that mindfulness meditation may improve anxiety for certain people. "If you have unproductive worries," Dr. Elizabeth Hoge, a psychiatrist at the Center for Anxiety and Traumatic Stress Disorders at Massachusetts General Hospital and an assistant professor of psychiatry at Harvard Medical School, told Harvard Health Letter, “...You might think ‘I’m late, I might lose my job if I don’t get there on time, and it will be a disaster!’ Mindfulness teaches you to recognize, 'Oh, there’s that thought again. I’ve been here before. But it’s just that -- a thought, and not a part of my core self.'" The Mayo Clinic also reports that many people control stress by practicing mindfulness meditation (plus it's been linked with lower levels of the stress hormone cortisol) -- for the basics on how to get started, click here. Helps sleep. Research presented at the 2009 Annual Meeting of the Associated Professional Sleep Societies suggested that meditation could be helpful in the treatment of insomnia. "Results of the study show that teaching deep relaxation techniques during the daytime can help improve sleep at night," principal investigator Ramadevi Gourineni, M.D., director of the insomnia program at Northwestern Memorial Hospital in Evanston, Ill., said in a statement. Plus, a University of Utah study released last year showed a connection between mindful personality traits and improved sleep quality. Check out four meditation techniques for improved sleep here.